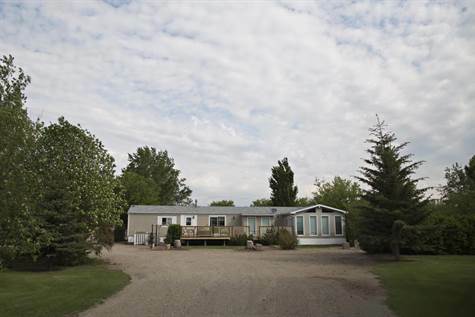 Year Built: 1991 "plus 2003 addition"
Beautiful 1,493 sqft manufactured home with a 3 bedroom 2 bathroom layout. The spacious kitchen and dining room has direct access to the large 2 tiered south facing deck (16ft x 16ft main deck+ 12ft x 5ft lower portion) and stone patio. The open concept continues to the living room with reading nook and through garden doors to one of the bedrooms that could double as an office/playroom/den. Down the hall is the 2nd bedroom, 4 piece main bathroom and the 2003 addition – a large family room with vaulted ceiling and plenty of natural light, The master bedroom has plenty of closet space and recently renovated 4 piece en-suite. The scenic and beautifully treed yardsite is complete with garden, firepit area, and sheltered front and back lawns. - Recently built corrals with horse shelter, coverall-style garage, garden shed and a greenhouse. - 10 acres of cultivated land is rented to the neighbor, pasture adjacent to the corrals has 4 strand perimeter fence.